There are so many to choose from that it can get very confusing which to buy first, and there are new ones coming on to the market all the time. Because of the cost many people think they are beyond their reach. And so my idea is to give you as much help as I can so that you can make an informed decision before you go out to buy, and not spend your hard earned money on dies that you don't know what to with. But they are such a versatile product and they can add some lovely shapes to your creations. And because of this Spellbinders are well worth considering. Then to make sure you get the most from your collections I have included more videos using other sets. And if there are any that you would like to see featured let me know ... and if I have the set then a video will follow. 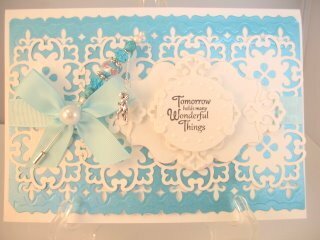 In this video Starting your Spellbinder Collection I have tried to show you how, with just a few of the dies, you can produce some cards that you can be truly proud to give. And each of the cards featured uses the same sets of dies... just a different colour to make the change. 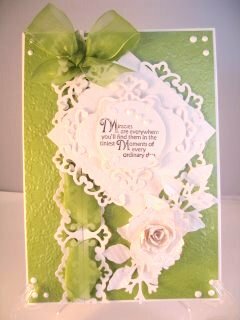 You will need the Grand Calibur Die Cutter to use the Flower Delight Impressabilities as it will add the texture to an A4 card in one go. You will need to read the makers instruction booklet for your machine to find out which plates to use to get the texture. you are going to buy some. And you won't be able to stop as you will be so pleased with the cards you produce you will just want to make more and more. I will be adding videos on some of the things that you can do with these dies and I hope they will help you to make even more choices about the ones you will get.